I’m getting pretty tired of writing about great policies and projects that we’ve proposed in Canada, only to have to write later that the government has decided not to fund them. Toronto’s Transit City project, an ambitious attempt to link the suburban parts of the region to reliable rapid transit through the construction of eight LRT lines, is under threat. Despite being approved by the federal and provincial governments, the province is threatening to cut Transit City funding by half, decreasing the viability of the project considerably. I’ve written before about how complex governance is when it comes to public transit in our municipalities. Vancouver’s struggles to build the UBC rapid transit line and many Canadian municipalities’ policies to better link transit and housing are detailed in several other posts. Even when projects are approved, it’s no guarantee they will be built because we have no stable source of funding for public transit and no consistent governance structure that enables the transfer of federal or provincial funds to municipalities. Transit City originally proposed eight lines: Sheppard (14 km), Finch West (17 km), Eglington Crosstown (33km), Scarborough, Don Mills, Jane, Scarborough Malvern, and Waterfront West. The province agreed to fund the first four back in 2007: of these, three are new lines (Sheppard, Finch West, and Eglinton) and the fourth is a retrofit of the existing Scarborough RT with four new stations. The province’s proposal to cut funding in half will put the Eglinton LRT, Scarborough RT, and Finch LRT at risk: the Sheppard line is already under construction while Eglington and Finch were to break ground this year and Scarborough in 2012. As U of T Social Work professor David Hulchanski illustrated a couple of years ago, increased incomes in the areas around the existing two subway lines make it all but impossible for lower- and middle-income people to live close to rapid transit. 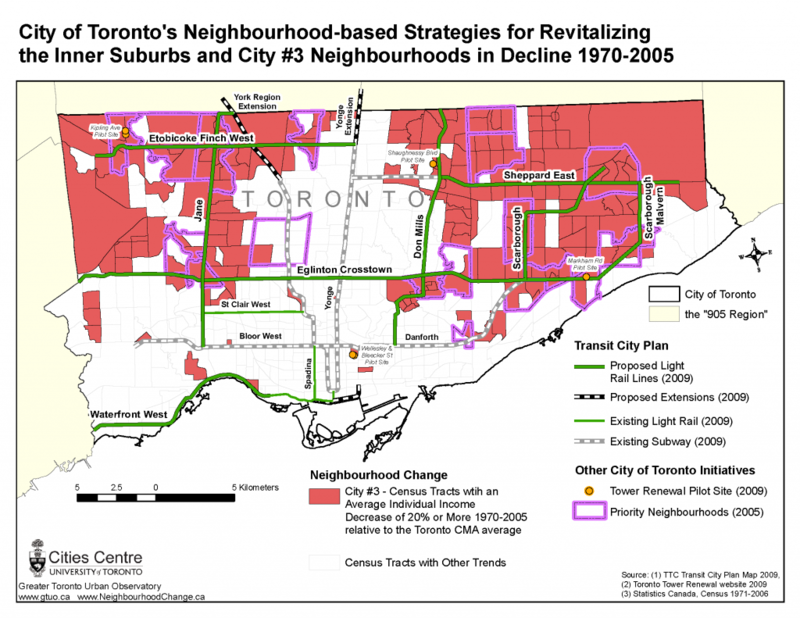 Hulchanski’s most recent map shows the areas which have decreased in income in the past forty years against the proposed lines: the new LRT lines would be making transit much more accessible to the rapidly-growing areas of the region (read his plea for action on ttcriders.ca). My own work with immigrants in Toronto shows that they are willing to travel long distances on infrequent public transit buses only for a short time; eventually they succumb to buying one, two, and three cars. They live further and further out because that’s where affordable housing is…little realizing their transportation costs will eat away considerably at their savings. Last week mayor David Miller recorded a public service announcement on the subway PA system telling people to call the Premier’s office and their MPPs to oppose the Transit City cuts. Many of the local mayors are also urging their citizens to do the same. All sorts of organizations, from Toronto Environmental Alliance to the Public Transit Coalition have links to the appropriate politicians, and there is a Save Transit City site. I urge you all to call, email, write the MPPs and Premier McGuinty and if you’re in the Toronto area, pack the Council chambers this Wednesday April 21st.